The ultimate anti-aging, 3-in-1 mist. This Optimizing Mist is infused with Hyaluronic Acid and Aloe Vera to optimize, refresh and hydrate the face and body. The Optimizing mist works synergistically with the NuFACE Gel Primer to keep primer activated and skin moist during the NuFACE treatment. By refreshing, the mist re-energizes skin and makeup for an all-day refreshed look. And by hydrating, the spray moisturizes and hydrates the face and body, leaving skin soft and silky. Hyaluronic Acid hydrates the skin by maintaining moisture in the connective tissue, alleviating wrinkles and fine lines. Aloe Vera provides oxygen to the cells, strengthening the skin tissue, which helps keep skin smooth and moist. 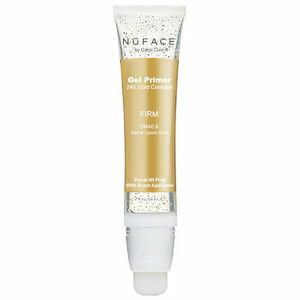 Keeps skin moist during NuFACE Treatment, allowing the NuFACE device to easily glide across the skin. Refreshes and hydrates skin throughout the day. 1. Cleanse face with an oil-free cleanser. 2. Apply NuFACE Primer and lift. 1. Apply to face and body throughout the day to moisturize and hydrate the skin. 1. Mist lightly over makeup and body for an all-day refreshed look. This aloe based spray is a mini facelift with additional skin nutrition. It makes the skin smoother and brightens and makes pores appear smaller.I apply it with a foundation brush before and after base makeup to help settle heavier makeup foundations and powders. This makes my skin look flawless with a glow.Makeup artist often use aloe baed products for short terms such as photo shoots to give a photo finish.